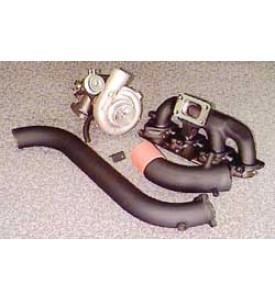 Want to smoke an Eclipse or Talon, run with a new 300ZX Turbo ? No problem if you have an 88-90 Conquest or Starion. We offer the ultimate performance package with the very best performance for your money. A true 280 HP in bolt on form and the potential for over 400 depending on other modifications. Although the stock intake and injection system is terrible we understand there are lots of Starion / Conquest owners who do not want to go to the expense and labor of retrofitting a complete new injection and management system. 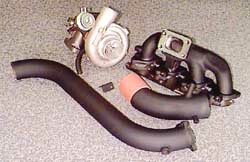 After extensive testing we have developed this turbo, camshaft, computer upgrade and fuel pressure system. if your engine is in good running stock condition this is all you need. The only internal engine mod is the camshaft upgrade and it is a true bolt in. If you have a 86 or 87 you need to upgrade the ECU and fuel injectors first. Stage 1..... 280HP @ 18 psi 13.7 sec. @ 104 mph. Street tires. New "Super V" T4 compressor with a T3 turbine turbocharger.